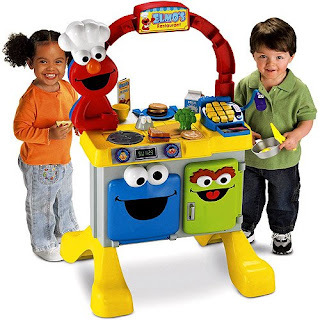 My son would lose his mind over this "Elmo's Restaurant". He loves to cook, and serve us, he even takes orders down on paper. He doesn't have a kitchen, but he does have a grocery store, and that's where he practices his culinary arts. Don't you love it? I think it's awesome. The dilemma? It's $98.00. WHOA. If I got him this for Christmas, chances are he wouldn't get much of anything else. But I don't think he would care. If this was assembled under the tree, at that moment the rest of the world would disappear. I should probably get it before it becomes an out of stock item. By the way....with no children in town, shouldn't I be doing something 'grown up' and wonderful for myself instead of looking on line for Christmas presents for my kids?